My next adventure is underway. 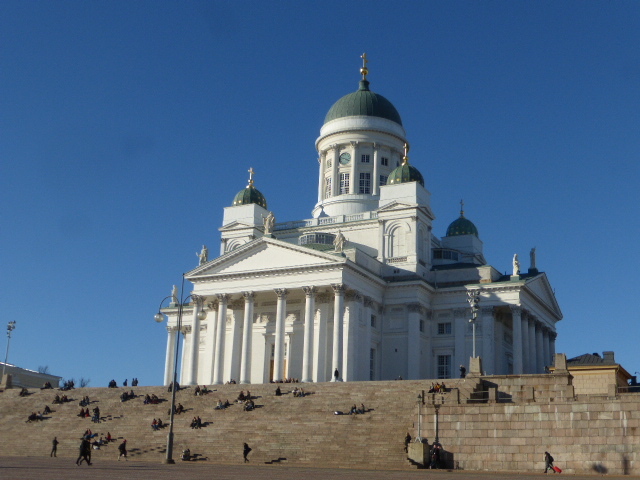 The starting point is Helsinki – the end point…who knows! And from the very beginning it appeared that things were going to be a bit challenging. Drama #1 occured as soon as I arrived at the airport. I was met by my fellow traveller who handed me the keys to his large (left-hand drive) transit van and he announced that, due to certain circumstances I had to drive. 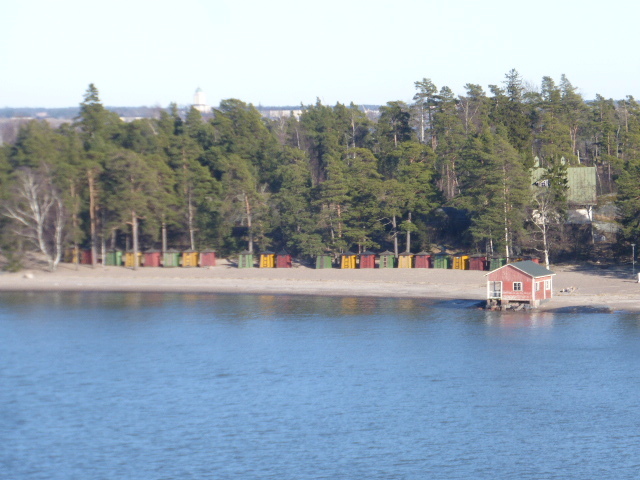 Out of Helsinki during the rush hour. Along the motorway which was being dug up and like a slalom course. And directly into the low setting sun and with the sand which had been laid on the icy roads during the winter whipped up into a swirling sandstorm. The only thing that I can say about that white knuckle ride was that the sky ahead of us resembled nothing that I had seen before – it was pure molten gold and more beautiful than any sky that I had ever seen. But we survived the journey and the next day we spent a half a day walking around Helsinki which is an OK sort of a city, but it is very spread out. 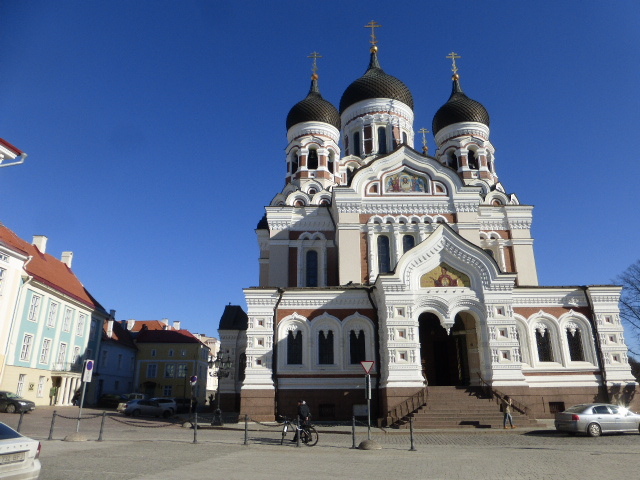 The highlights are the Uspenski Cathedral with its red brick and green onion dome roofs and the fantastic-from-the-outside-but-plain-inside white Cathedral. 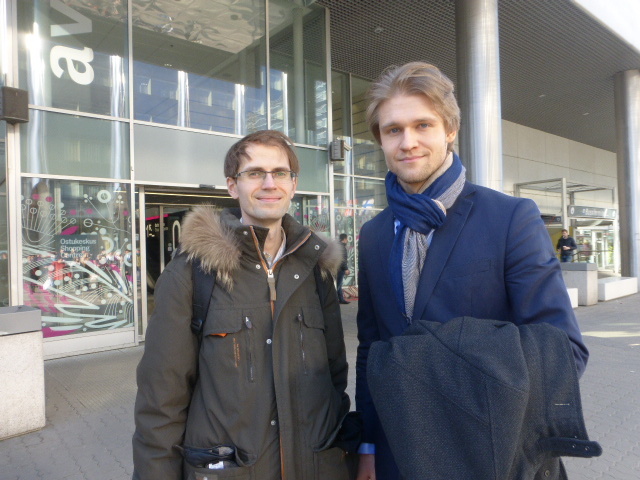 Drama #2 began after we had booked a night in an apart-hotel in the dormitory town of Espoo over the internet. The hotel had no receptionist present at any time. When you are sitting in your vehicle and you have very intermittent internet access and no Finnish SIM card and you have paid for the night over the internet but cannot open the email which contains details of your room and the key code, you cannot even begin to express your frustration. But eventually we sorted that problem out and got into the hotel. On day 3 we were back in the van for another white knuckle ride back into Helsinki for the ferry port. Dodging the trams I was quite proud that I only managed to jump one red light – I didn’t notice the junction let alone the traffic lights – but I was just relieved to reach the terminal in one piece. And then there was drama #3. Two very large border guards were cruising around the queue of cars when they pulled up alongside us and studied us intently. We KNEW that they would be interested in us and then they were asking for our papers. While everything was in order things were not straightforward (but not my story to tell at this stage here) and then I was being asked to blow into a breathalyser and I had the cells from my tongue scraped for a roadside drug test. When everything came back negative (alcohol, marihuana, opiates and amphetamines) the border guards lost interest in us, allowed me to take a photo of the drug test and decided that they didn’t need to pull everything out of the van. And so I drove us onto the MS Finlandia for the 2.5 hour trip across the Gulf of Bothnia to Estonia. If driving in Helsinki was nerve wracking I almost had a complete meltdown in Tallinn. Driving off the ferry I was horrified to discover that here there were trolley buses, which instilled fear into me as unlike trams they were perfectly capable of veering off their tracks and EVERYBODY was driving at twice the speed limit (at least) and they are, I think, probably the second most aggressive, fast drivers in the world – after those in Bahrain. 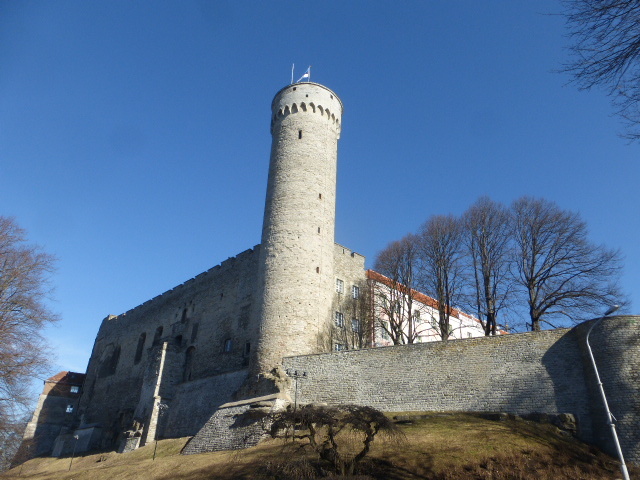 We tracked down our hotel for the night which was in an old stone building that was once a sauna complex for the town, and from which we could see the large castle which dominates Tallinn. On Sunday morning we set off on foot to explore, wandering around the little winding streets although it was next to impossible to get lost as the tall spires of the various churches which rose above the walled city acted as good orientation points. 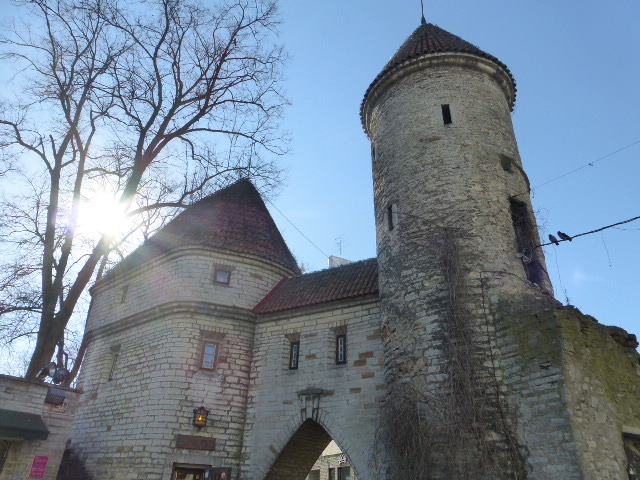 Tallinn has an incredibly well preserved wall surrounding much of it and little streets which are a charming mix of the traditional wooden houses and the modern. The old town square was picture postcard perfect in the warm winter sun and we were lucky enough to bag a table outside one of the little bars and rest for a while. We visited the Orthodox cathedral which is up near the castle complex. The inside was atmospheric with the smokey haze and scent from the candles and the incense rising high up into the onion dome. Pillars were painted with flowers and swirls and there was constant movement as people flowed between the various icons and altars, many stooping to touch the floor and some even kneeling to kiss the floor in front of some of the relics. I had really enjoyed learning Spanish when I was travelling in South America and now on this trip I want to learn a musical instrument. Many travellers have guitars or drums but as I desperately need to reduce the weight that I carry, I opted for the harmonica. Back at the hotel that evening S, my fellow traveller who can play many instruments very well gave me my first harmonica lesson. I thought that it went rather well, and rather easier to learn that Spanish but some of the other hotel guests may argue otherwise. 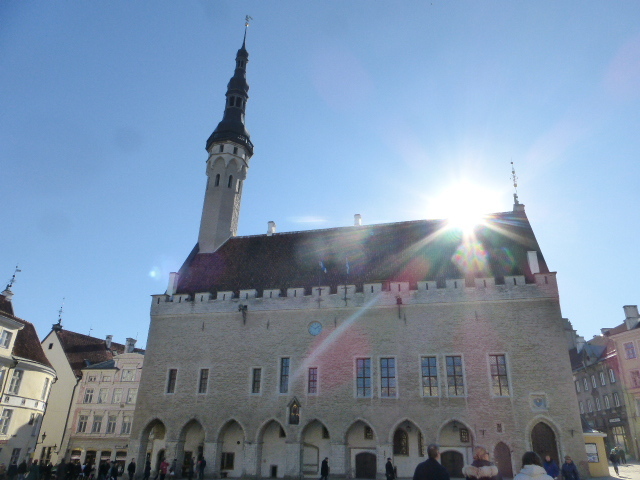 The following day I went out alone to explore Tallinn. I found the ‘Knit Market’ where rows of stalls are set into arches underneath the town walls and ladies sit knitting and selling their woollen socks and jumpers. I found the ‘Cat Well’ where in the olden times people would throw the stray cats (dead and often alive) as a sacrifice to ensure that the water to the town wouldn’t run dry – never mind about the risk to the public health from the decomposing bodies. And I saw St Olaf’s Church with its slender spire and which was once the tallest building in the world, although it and all of the other museums were closed, either because it was Monday or the ‘wintry season’ or both so I was unable to climb the tower and look out over the red roofs of Tallinn. I was stood in the street studying a map when two young men approached me and asked if I needed any help. Forty five minutes later we were still chatting by the side of the road. Andri, smart as a pin in his blue suit and Gunner a teacher, both spoke excellent English and had a cracking repartee of anecdotes and observations on life. They were hilarious and I was sorry to have to move on and to say goodbye to them. And a little later in the day they emailed me to tell me that just after we had separated they had been fined for jay-walking! Estonia, like many places that I visit, has surprised me. I try to travel without any pre-conceptions and always with an open mind, but you can’t help but absorb information which the media decide should shape your view of the world. I have always thought that it is so important to watch the news and to be aware of what is going on in the world, but as I travel, I am more and more disillusioned, not by the news itself, but by the spin which is placed on the stories and which distances us from other people, countries and cultures. 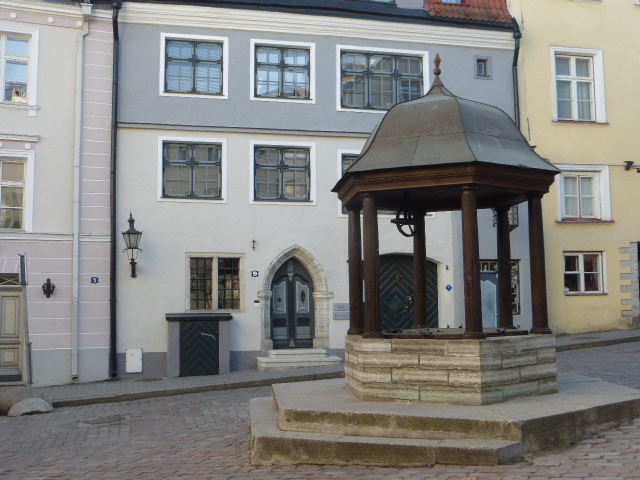 Estonia is spotlessly clean – from the streets without litter to the clarity of the air. 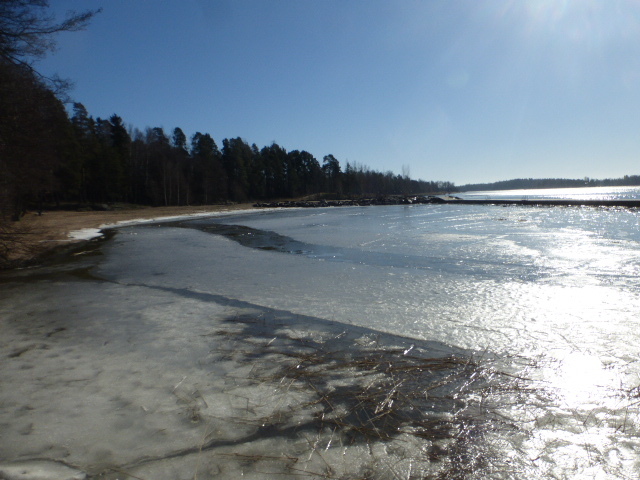 For all of my first week I was blessed with brilliant blue, cloudless skies, crisp cold mornings at freezing point, but with temperatures rising rapidly in the sun during the daytime. Most people can speak many languages – English, Russian, Finnish and Swedish seemed to predominate and they are friendly and keen to chat. I love to travel and to see things. Old buildings, modern towns, forests or beaches are all fantastic but for me, it is the connection with people who make my travel so special. Andri and Gunner were a chance meeting by the side of the road but they made my day in Tallinn, so for this journey as I travel down through the Baltic States I intend to delve a little bit deeper into the lives of the people that I meet and bring you some of their stories. I hope that you will follow me and accompany me on my adventures as I head south. There is no stopping you is there. Would love to know why u had to be tested for drugs – am assuming something was on your travel companions documents?? How was your xmas – was ages ago now and am now thinking should I get the tree out of the loft again as this xmas is not far away. Really enjoy reading of your exploits – take care and be safe. It’s nice to hear from you. We have certainly had plenty of dramas in the last 10 days – I will probably put it all in a post at the end of this trip because I suspect that there will be plenty more to come – but yes – I am having a good time. Christmas was good and seems ages away but I have plenty of plans before the next one comes around. Great article Scarlett, dramas make a trip that much more memorable don’t you think? Wilbur. They certainly do Wilbur! And we seem to be getting our fair share of them on this trip. Sorry but what means “they were fined for jay walking”, I know what a ‘fine’ is, and what a ‘walking’ is, but to be fine for some sort of walking? I’m intrigued. Sorry my ignorance, but as somebody said, ignorance is the opportunity to learn! Hi Milton. You are not ignorant at all, and feel free to ask at any time. To be fined means to be given a payment for a punishment.